We need your help – urgently! Overall we’re still targeting a reduction in heating requirement of up to 95%, and to be a net producer of energy. All of this can only get built though if we can get planning approval though, and to date that has been difficult. We need to show that there is support for this type of sustainable building. We’re getting our neighbours to write letters of support, and add supporting comments to the planning application online – but the more we can get, the better. Or you can send your response to planning@trafford.gov.uk. Please be sure to include the planning application number (81791/HHA/2013), your name and address and your comments. Please do what you can – we only have until November 27 to get comments in! I thought I’d start with something scene-setting, rather than the slew of practical books that I usually recommend. “Collapse: How Societies Choose to Fail or Survive” takes a look at the collapse of historical civilisations, and then sets that in a modern context. Diamond looks at deforestation, overpopulation and pollution, and the inability of civilisations to live within the capacity of the land they actually live in, rather than the one they wish they inhabited. I thought it was quite well written, although it did need a bit of perseverance at the start. It cleverly took me from the position of smug modern human, mocking those foolish primitive islanders, through to foolish modern Australian, being paid to deforest the land. It was not all doom and gloom though – there are some good examples of societies that have struck a balance and survived whilst neighbouring civilisations fell. Overall, it does a lot to highlight how precarious our “all-powerful” societies really are. Well worth a read. Look on my works, ye Mighty, and despair. If you like the sound of it, pick it up at your local library or bookshop, but if you have to buy it online please follow this Amazon link – Collapse: How Societies Choose to Fail or Survive and the Trafford Eco House will get some money from your purchase (it won’t cost you any more). So there we go – going down, albeit affected by the driving from our recent holiday. We need to work on getting the gas down further though. 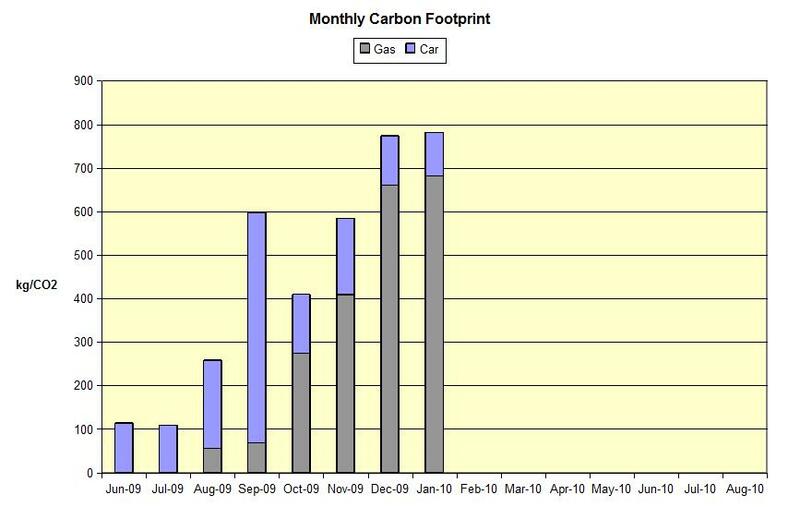 It’s been a while since I posted our Carbon Footprint results, and what better time to do so than just after such a brutally cold spell. This really highlights the difference between the light, warmer months and the dark cold winter. 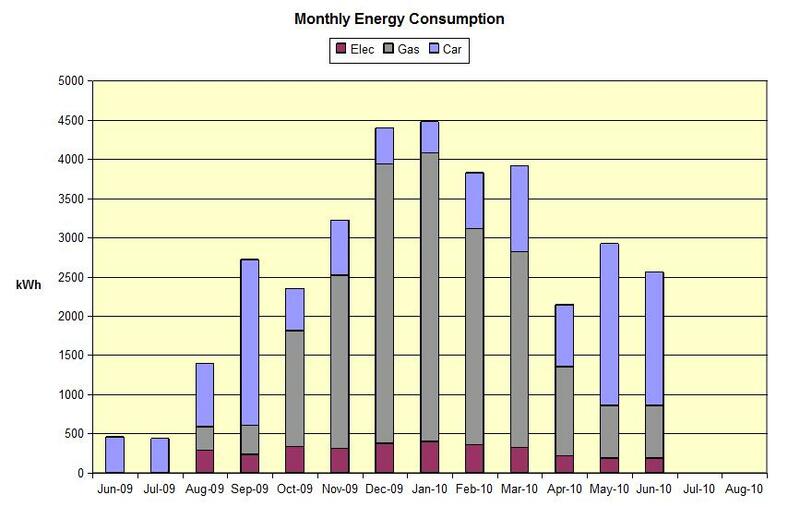 That’s a major difference from our starting month (August) of 1396 kWh – and all the increase is due to gas used for heating. Interestingly, there was not a significant change in electricity consumption, even though the aquaponics system is now running and we did use an electric heater in the polytunnel on several occasions. We just scraped in under 1 tonne, mainly thanks to an extremely low mileage this month (thanks to being snowbound mainly). So there we go – still going up rather than down! Very interesting going through our first winter in the house, let’s hope the consumption is down from here. 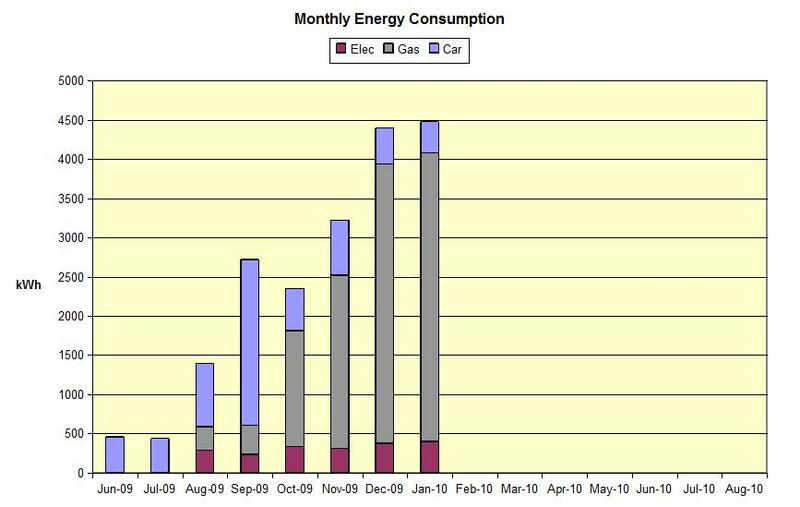 Our second full month in the eco-house, the figures this month are affected by the 12-day holiday we took this month. It was a serious driving holiday – Trafford to Central Germany. We could have flown, but decided to take the “eco” option – we’ll have a look at how green that was later. This month saw the heating start to come on – albeit on a very occasional basis, and we’re using the lights a lot more in the evening. That’s the difference you see when you drive 2154 miles instead of the 830 in August. Interestingly, there was not a large drop in electricity consumption, even though we were away for more than a third of the month. So there we go – going up rather than down! Not a great start to the monitoring, but mostly due to the one-off impact of that 1800 mile across-Europe driving holiday. We’ll see how we go in October, now that the heating is on and the lighting is getting good use too. 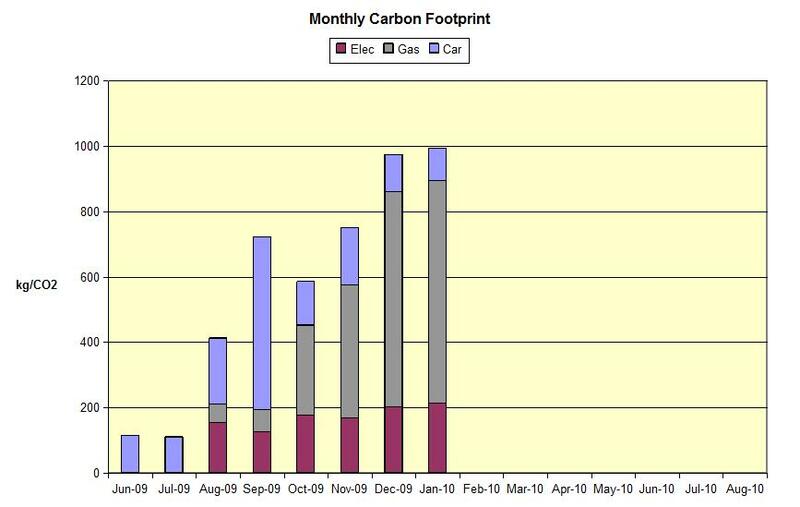 We’ve had our first full month in the Eco-House, so here’s our monthly report – our Carbon Footprint for August. We’ll be plotting these each month on a graph to see how we go. I’m anticipating that this’ll be one of our lowest months – the lights have hardly been on, and there’s been no heating used. It’ll be interestiung to see how we go through the winter, and then how next year’s figures compare. 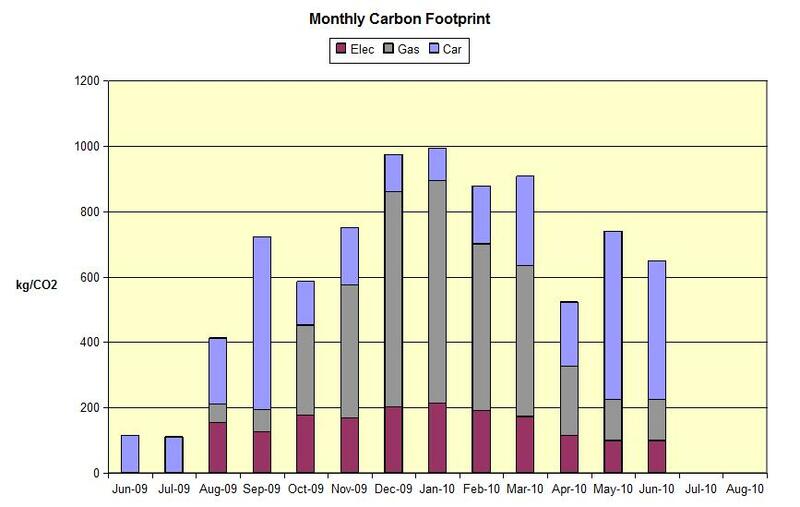 What’s interesting to see here is how the electricity we use has a much higher impact on our Carbon Footprint than it should for the energy we use. With that in mind we’ve changed electricity supplier to Good Energy. Good Energy only supply electricity from renewable sources, so we can remove electricity from our carbon footprint. So that’s a significant reduction – 37% off our carbon footprint in one go. 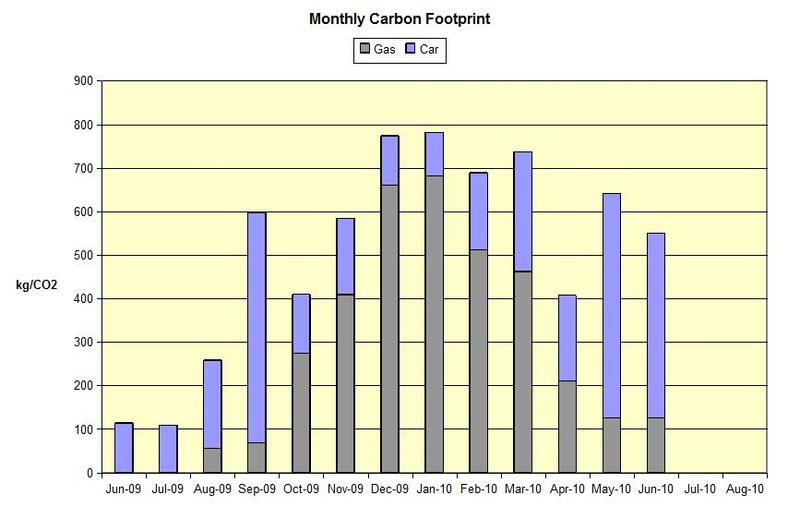 If every month was the same as August we’d be on track for an annual carbon footprint of just over three tonnes. Not bad for the four of us. Unfortunately not every month will be like August – so we’ll see how we go! Our initial target is to come in well under the nine tonnes of CO2 per adult that is the average Mark Lynas quotes in the Guardian. To make the comparison fair though we need to include a couple of other things on the graphs – water consumption and public transport use. I’ll try and get some of those on the September figures.